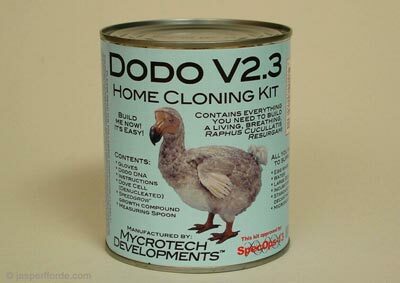 Dodo Home Cloning Kit. Having come up with the idea of home cloning kits I was wondering what form this should take. After thinking about a cardboard box, very large and with instructions, I thought that probably it would be quite small, and need to be sealed for freshness and sterility. Why not a can? This is a large size baked bean tin with the label removed and a new one designed in its stead. As can be seen from the label, this tin contains all that you need to build a living, breathing, Raphus Cuculatis Resurgam! (I added the resurgam bit; I append it to all reengineered creatures - it means 'risen again') The kit would contain: Gloves, dodo DNA, Instructions, Denucleated dove eggcell, 'Speedgrow' growth compound and a measuring spoon. I guess this is something you can do in your kitchen with a whisk and a large bottle. Sit back and watch your dodo grow! Note 'SpecOps 13' double helix logo which pops up elsewhere on the postcards, in particular, LGB 036.